Blast-A-Way is the newest title from Illusion Labs, who are known for their visually-stimulating titles like Labyrinth 2, and the Touchgrind series. Now, they’re entering the realm of physics puzzlers. Players control robots who need to use bombs to get to the exit. 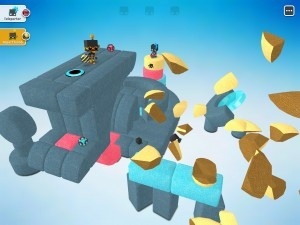 The bombs come with different properties: some just blow up, others can pick up the color of the block that they bounce off of, and others can teleport the player to a block of the same color. However, they can’t just go around blowing things up all willy-nilly, as bombs can only interact with blocks of the same color. As well, they need to save the tiny boxies, little baby robots that are stuck in the blocks and often in perilous positions. Portal fans will get a kick out of the game, and not just becuase there are portals involved. 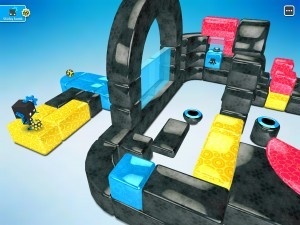 The puzzles have a very similar feel, players use the environment to get to the goal. While there are fewer reflex-based challenges, trying to collect the boxies does add a degree of difficulty. The sparse environments help with that similarity as well, though the splashes of color keep things from feeling stale. The 3D nature of Blast-A-Way made me curious as to how precise one could be in the environment, and actually, the game is structured well enough to where it’s not a problem. In general, the boxies won’t go flying off to their doom if the player is doing something right. Whether this is the invisible hand of Illusion Labs’s engine ensuring this or just really well-done design, it does give the player some confidence that the boxies will only be doomed if the player explicitly messes up. The controls can be a challenge to deal with, but I fault them in no way. With a touchscreen involved, they seem like the best method of control. Players tap and hold on a block or place on screen to target, and then let go at the desired angle. Drawing a line from the robot moves it to its proper location; it cannot fall off of ledges just by moving. Dragging on a piece of the level moves the view around, and dragging around outside the level rotates the view, with pinch-zooming, and two-finger vertical swiping to control the view height. Occasionally, adjusting the view or targeting a certain spot is problematic, and I did make some accidental mistakes because of these somewhat-complex controls. But, given the relative complexity of these controls, I can’t blame the game too much. IT ultimately does its job, and the controls are consistent. Blast-A-Way has plenty of outright brilliant moments, and it’s sublime when a puzzle comes together just perfectly. Illusion Labs has a great feel for how iOS games should work, and it’s in effect here with Blast-a-Way.